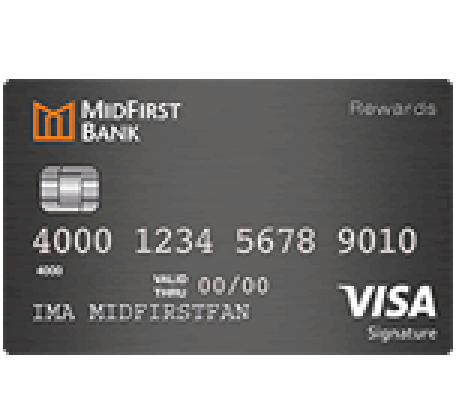 The MidFirst Bank Rewards Credit Card standard credit option which may only be worth investigating if you already have an account with the issuing bank. 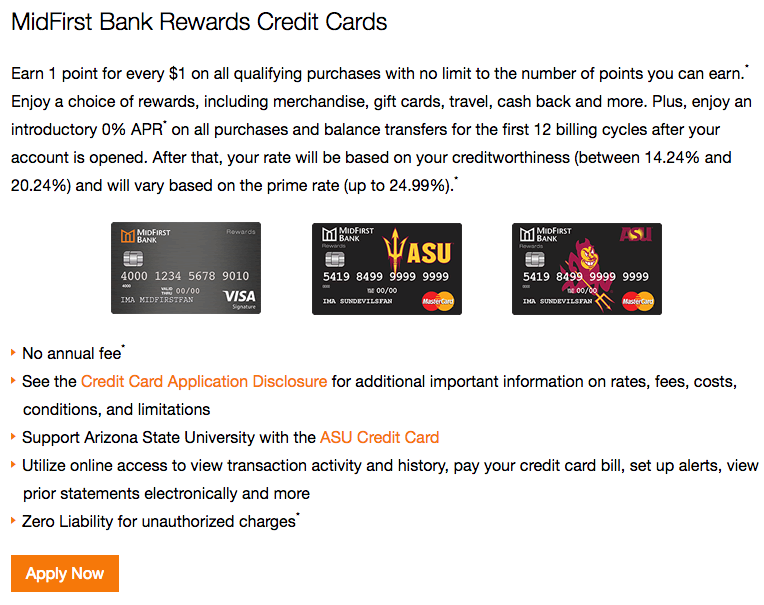 The rewards program is standard at 1 point for every $1 spent on qualifying purchases and the APR is average at 14.24% to 20.24%, depending on your credit-worthiness (APR is subject to change). That being said, there is no annual fee, so if you qualify for the lower APR and keep up with your bills, this card offers some benefits at virtually no cost. 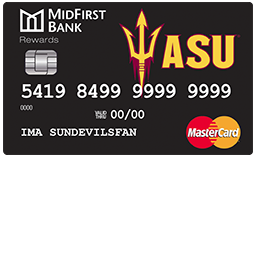 If you would like to apply for the MidFirst Bank Rewards Credit Card, scroll down and follow the step-by-step guide that we have created to walk you through the online application process for this card. We recommend that you read the MidFirst Bank’s Security Measures before you enter any important private information on their website. 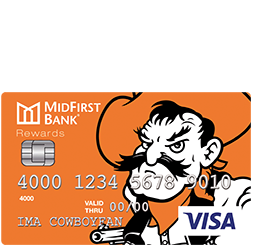 Step 1- Navigate to the MidFirst Bank Rewards Credit Cards by clicking here. Then click Apply Now. Step 2- Clicking the Apply Now link should take you to the application page pictured below. Step 3- To complete the application process you will need to read the E-Sign and Credit Card Application Disclosures and tick the box indicating that you have done so and that you agree to the terms of their disclosures document. Step 4- Next, indicate whether you have any other existing accounts with the MidFirst Bank. Step 6- Following the submission of your personal info, you will be asked for the following contact information where the MidFirst can get ahold of you. 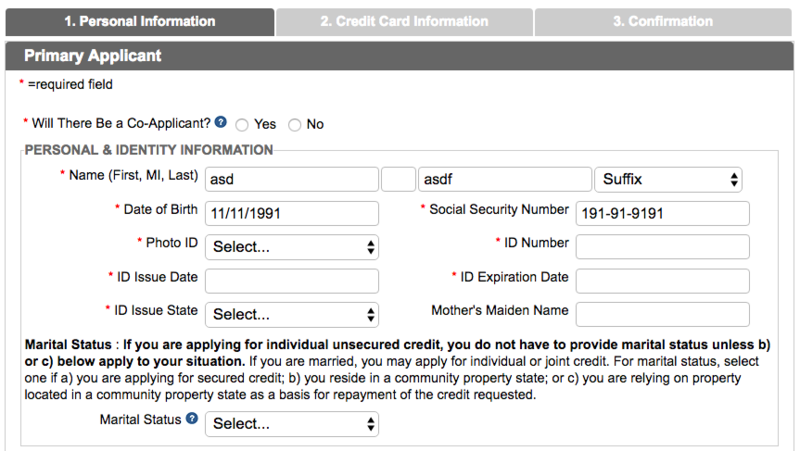 Step 7- Select MidFirst Bank Standard next to Type of Credit Card, and select your Purpose of Loan. Ignore the Type of Collateral Offered as this does not apply to the MidFirst Bank Rewards Credit Card. Step 8- If you have been given a promo code, enter it here. Otherwise, leave the field blank. Step 11- Complete the Employment & Income Information section of your application by providing your Employment Status, the details of your employment situation and all of your other sources of income. 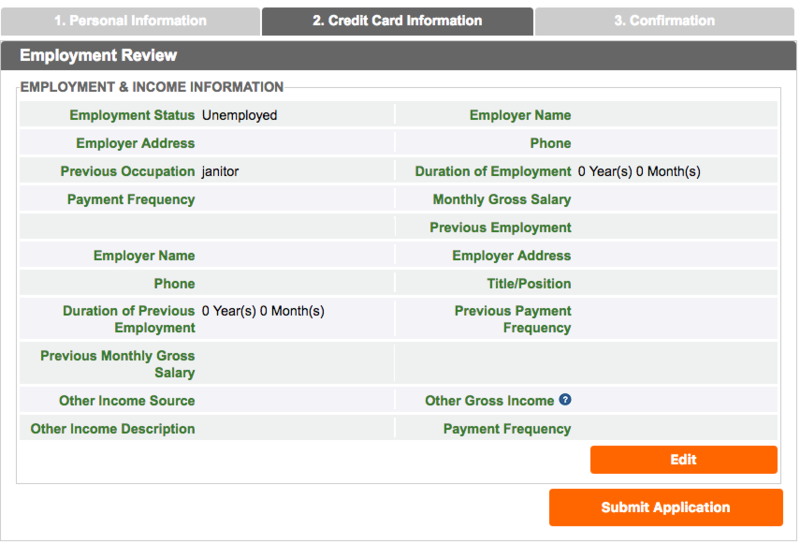 Step 12- If you have any additional information or comments that you would to add to your application, enter them in the blank field like the one seen in the example below this text, select whether or not you will use Automatic Payments. Step 13- Before you submit your application, look over the information that you have entered and edit anything that needs correction. 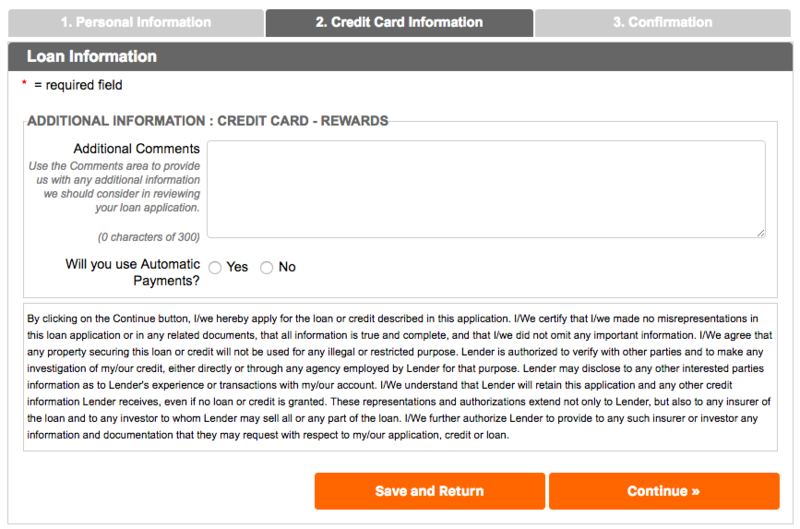 Then review the terms and conditions of the MidFirst Bank Rewards Credit Card. When you are ready, click Submit Application. Step 14- You’re application is submitted, save your application confirmation number in case you need it for reference. Click Finish to exit the application. You should soon receive a response regarding your application. We wish you luck and hope that our application guide has been helpful.